For the second year in a row, Smith Optics is the proud recipient of the ISPO Award for Design and Innovation. Following last year’s win for the Vantage Helmet with Aerocore technology, the 2014 title has been presented to the brand for the new interchangeable I/O 7 Goggle for the Ski segment. The I/O 7 goggle features a minimalist design and a single-pivot quick release lens that is intuitive, efficient and easy to use. The addition of dual axis outriggers provides vertical and horizontal articulation for better fit under or over a helmet and AirEvac integration technology for increased ventilation and full helmet compatibility. The Facial Geometry frame design provides full field of vision while the spherical, Carbonic-X lens with TLT Optics increase visual acuity and enhance contrast sensitivity while offering optimum scratch and impact resistance. All performance lenses feature Smith’s proprietary 5X Anti-Fog inner lens to eliminate condensation and moisture build up, for the most advanced anti-fog lens ever created. The I/O 7 will be available in 15 colour ways and includes two performance lenses. 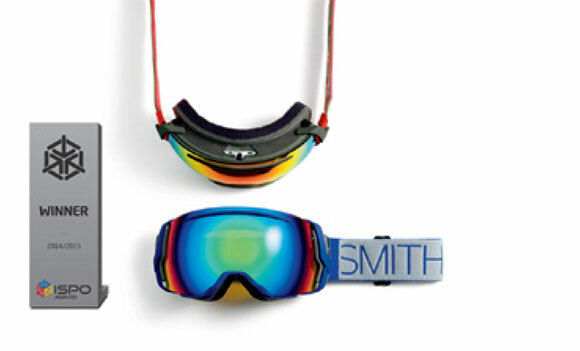 The new I/O 7 goggle will be available at specialty retailers and online at smithoptics.com beginning early Fall 2014.